The Indian software firm’s all-in-one business app suite has seen impressive growth since its launch in 2017, says analyst. Zoho has unveiled a range of updates to Zoho One, its all-in-one cloud app suite, with new analytics capabilities and access to its Zia AI assistant. 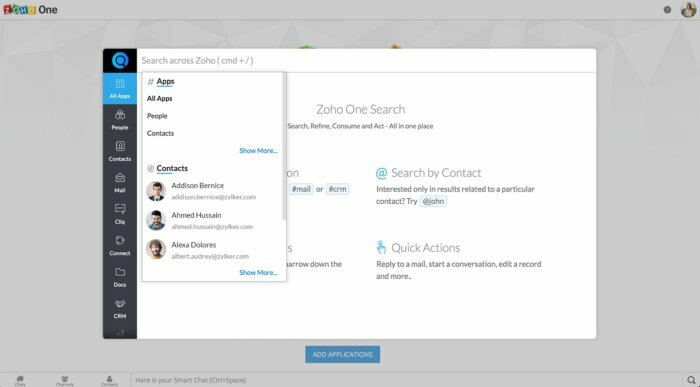 Billing itself as “the operating system for business.” Zoho One launched in July 2017; it bundles more than 40 of Zoho’s apps, spanning CRM, HR, business analytics, office productivity tools and others. Subscriptions start at US$30 a month per employee. The Indian company has added a variety of new features to Zoho One since its launch. Its Slack-like team chat tool, Cliq, unveiled last September, was followed by Zoho Flow, a no-code, automated workflow automation platform, which rolled out earlier this year. The company’s Sprints project management and PageSense website testing tool are also included in the packaged offering. As part of the updates announced this month, the vendor also plans to bring its two-year old Zia AI assistant to Zoho One. 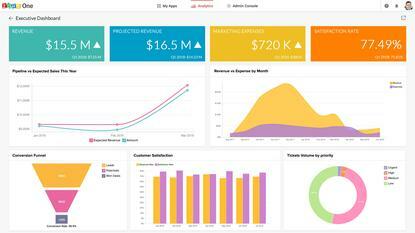 Zia was initially available within Zoho’s CRM tool, offering suggestions to sales reps based on customer data. It will now be extended across all Zoho One apps, offering contextual information from a variety of sources. For instance, Zia can pull data from Zoho CRM and service desk tool Zoho Desk to inform users of how many customers in the sales pipeline have an open support ticket. “Because [Zoho One] is built with integrated apps and data structures, it makes it easier for Zia to access a variety of data to provide highly specific insights,” said Brent Leary from consulting firm CRM Essentials. The AI assistant will be rolled out gradually starting this year, Zoho said. Plans are also in place to open its Zia Platform developer tools to Zoho One users to enable the creation of custom skill sets tailored to individual business needs. Other upgrades include Zia Search, which lets Zoho One users search across all of their apps, providing a results preview and suggesting contextual actions that can be carried out without leaving the search window. A new Zoho One Analytics tab lets managers stay up to date on key performance indicators and trends, with custom report creation and dashboards that gather data from different business apps. There are more than 500 pre-built custom reports and dashboards provided, and users can pull data from third-party apps to integrate with Zoho’s data. The latest addition to the company’s expanding app portfolio is Backstage, an “end-to-end event management” platform aimed at simplifying management of large conferences, trade shows and product launches. Alongside the new features, Zoho provided an update on Zoho One adoption. More than 12,000 businesses worldwide have moved to the platform, 40% of which are in the U.S. Deployments range in size from one to 20,000 users and Zoho said customers use 16 of the 38 apps on average, in some cases replacing various tools from different software vendors. Among those users is New Zealand based retail giant The Warehouse Group. In a statement, Timothy Kasbe, the retailer’s chief information and digital officer said Zoho One has been deployed to all 12,000 of its staff. Continuing that kind of growth presents challenges, since Zoho is competing with larger business and productivity app providers such as Microsoft and Google. Leary sees the biggest obstacle to expansion as Zoho’s need to meet the expectations of mid-market and enterprise customers while continuing to provide its core small business audience with the products they expect.